Donald Trump's children were key to the final moments of the debate Sunday night. An undecided voter in the audience of the town hall posed an unfamiliar question. "Regardless of the current rhetoric, would either of you name one positive thing that you respect in one another?" Perhaps surprisingly to Trump, Clinton responded that she respects him for his children, as they watched on from the audience. After such an acrimonious debate, the two candidates even shook hands. So what about the next go around? Will Trump's sons be at the last debate? There's no official confirmation yet on who will be in attendance, but it's highly likely that Trump's three oldest children — both his adult sons Donald Jr. and Eric, as well as his older daughter Ivanka — will attend. They were at both the first debate and the second, where they sat in the VIP booth, and they have been acting as surrogates for Trump throughout the race. They spoke at the Republican National Convention, and have been busy on the campaign trail ever since. That doesn't mean they're the best surrogates. The Daily Beast ran an article titled, "Donald Trump Jr. Is the Trump Campaign’s Worst Surrogate." Evidently, as the piece pointed out, Donald Jr. told the Pittsburgh Tribune-Review in September that his dad's tax returns would cause problems and questions, instead of the official story that he's under audit. Then there's his infamous reference to gas chambers — not so smooth either. People will today make what they want of anything and they see the worst in everything and they look for subtext that doesn't exist. For me, I guess I'm a straightforward guy. I don't deal in microagression, where it takes a special kind of person to find whatever message they're looking for. Eric might not be perfect either. While trying to apologize for his father's latest video leak in which he bragged about sexually assaulting women, Eric kind of tried to defend the behavior before calling it unacceptable. Eric went on the Dan Caplis Show and said that Trump's conversation with Billy Bush on Access Hollywood was alpha male behavior. "That conversation, it was locker room banter, I mean, that's really what it was," he said on the show. "It was two alpha guys in a thing, and by the way, it is totally unacceptable." "Locker room banter" is probably official campaign speak, but "alpha guys" is new, and does not make the issue sound any better. 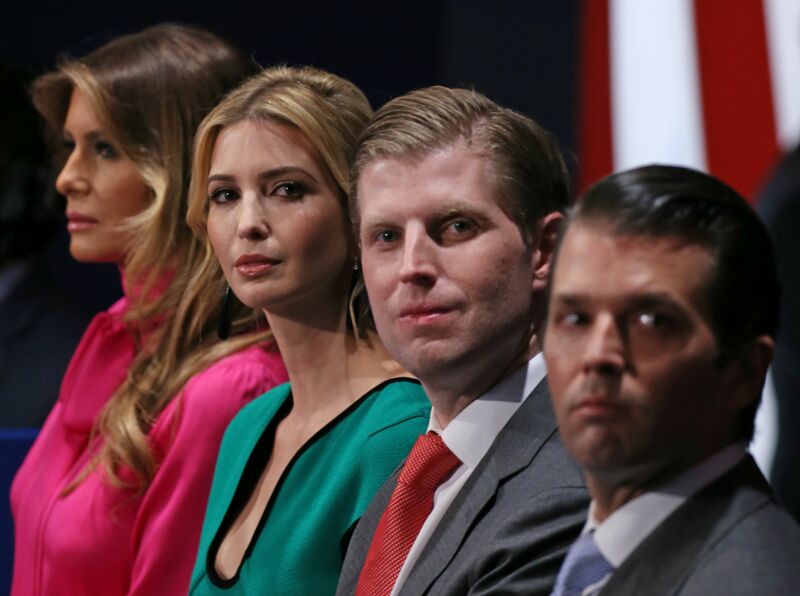 Even if Donald, Jr. and Eric aren't perfect, they're still Trump's kids — and it's highly likely you'll see them at the last debate.